"Vintage" or Just Outdated? 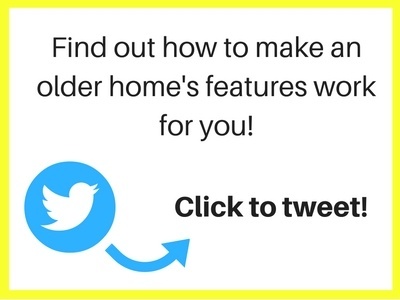 Make Your Older Home's Features Work for You! The old adage, “beauty is in the eye of the beholder” certainly is fitting for any type of home decorating. One woman’s love of antique china is another’s definition of old lady dust collectors. But determining what is vintage and what is just plain old is hard when it comes to features in a home that are permanent. Check out these real examples of old vs. vintage from my rental home history. What to do with an entire bathroom tiled in turquoise and white from floor to ceiling? The custom turquoise sink and toilet completed the look nicely. I simply embraced the situation and worked the color scheme by adding white linens, fresh white tulips, and touched up any white grout I could to make the bathroom sparkle. Today, this bathroom would be considered vintage because the tile size was only produced in the 1950s. In the same house, the dining room and kitchen were covered in walnut colored paneling. Not even the quality stuff, just the cheapest the owner could buy. I absolutely hated it and immediately used a neutral green to cover the walls. The painted outcome resembled bead board and I styled the room to have a cottage feel. The paneling was just old, no way around it, but the cottage look was so much better. Renters and buyers may be put off by some of the more awkward features an older home has even if they find them historically correct and charming but their functionally is non-existent, or worse, space wasting. Usually there are two ways to make the most of a vintage home: highlight the good stuff and camouflage the bad. 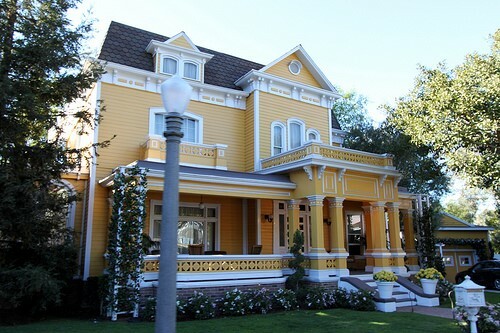 Vintage homes are known for their one-of-a-kind woodwork, especially in trim and molding. By highlighting these features, perhaps with a higher gloss paint than the walls, the eye rests on the best part of the room. The same holds true for intact and in-good-shape original windows. Expose their originality! If privacy is necessary, use the bare minimum of covering. Spring rods with a sheer white curtain are a versatile way to incorporate privacy. If the windows are just ugly, old, and non-useable or in a poor location, the same curtain technique hides their deficiencies, (especially if floor to ceiling coverage is plausible) but allows light in and adds an airy effect. Period homes often have living spaces that don’t really work for today’s families. Furniture size and placement will be key to making the old flow work. Usually multiple, but small, sitting arrangements work much better in narrow homes like traditional row houses and shotgun style homes. Styling is an important tactic for deflecting attention from any unappealing features. Building a radiator cover to hide its imperfections is an option, as is arranging small furniture accessories to conceal outdated ventilation or wood floor damage. It’s also important not to overdo any single style of home. Just because you have a rustic or country house doesn’t mean it should look like a Cracker Barrel inside. Knowing when enough is enough takes practice! If you’re still confused if your home has vintage or old features, just go with the idea that if you love it, it’s vintage and if you hate it, it’s old! Do vintage properties make you happy? MilitaryByOwner has an Advanced Search feature that will limit homes by their age. Or, take a look at the advertised homes to see how they work their vintage style!